Earlier this year I took a Swedish friend to this great little honky-tonk on the outskirts of Austin, Texas. As we drove north on Burnet Road, passing “Billy’s on Burnet” and “Ginny’s Little Longhorn” we finally arrived to number 19 on the 86th block and Buddy’s Place. There’s no other way to figure out what it looks like on the inside than to actually step inside. Like any other real honky-tonk it’s a refuge from the outside world and therefor lacks any openings besides a front door and, of course, a back door. We drove around to the back side of the building to park and found our way in. On the way up here I told my friend, who’s not a country music fan at all, a little about why honky-tonks are important places and how it comes so many songs has been written about them in order to get him prepared for what to expect. Bars like this is on the verge of extinction and I felt very obliged to show my friend one of the few remaining real honky-tonks in Austin, so when I found he wanted to leave after just two quick Lone Stars I felt sad that my friend did not give it more of a chance to find out what the rest of the world will be missing not to far down the road from today. I figured he felt intimidated by the dark interior and, being a swede, maybe a little awkward by the friendliness of the, to him unknown, patrons. Well, we left and went to the other side of town to see if we could find a place more suited to meet his expectations. After all, he was my guest and responsibility. This incident later got me thinking about why I love bars like Buddy’s Place and for how long they will find new patrons to hand them their hard earned bucks in exchange for a couple of hours in dimly lit sorroundings, thinking about and sharing lifes stories to the tunes of old country songs. With todays radio playing country music with superficial lyrics about dirt roads and pick-up trucks, who will find the true essence of what country music is all about? Honky-tonks is where you go to get away from expectations and to forget about your own troubles for a while. Where you won’t be reminded of that old piece of junk parked out front and that you live alone in a one room apartment with no place to cook a real meal. The fact that country music so often tells down-on-your-luck stories is because it feels good to find you’re not alone with your problems. It’s not to make you feel sad, it’s to ease your mind. This is what you find at a bar like Buddy’s Place and I think that most people today are seeking to get entertained by others as a way to forget about their every day life, not forced to have time alone with them selves or in company with people reminding them of who they are – humans. I’m afraid this will be the reason why honky-tonks and bars like that will dissapear. The future for these dives is dependent on peoples willingness to look into them selves for an understanding of who they are. Of course these bars also attract and become livingrooms of drunkards and alcoholics but they are also real people and what better place to drink than in the company of others listening to good music could you find? I am of that belief that drinking by your self will probably hurt you more. We drink because we have not yet found another way and until we do I welcome us all in to company and will gladly share my time and my bucks if that helps anybody in any way. 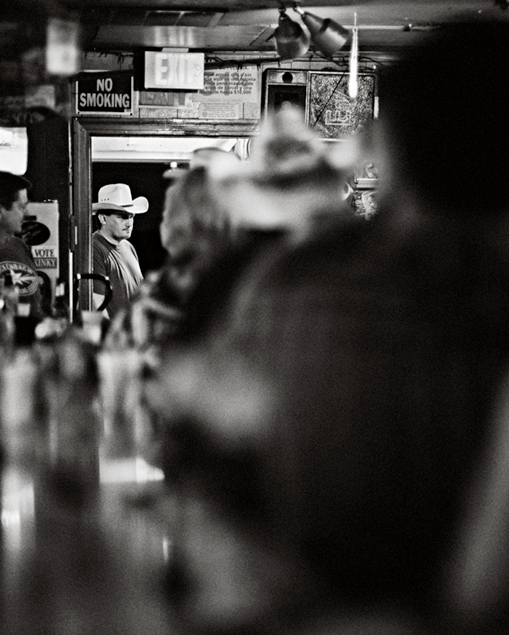 In all honesty, when I’ve been down on my luck, I’ve always found myself welcomed at a honky-tonk anywhere in Texas. I encourage you to go and spend some time and money at a honky-tonk of your choice. Invite someone in need of company to share a couple of songs telling their lifes story. Do it now and help these institutions to survive, they are the essence of country music history.